You all know we love packaging, and we understand its importance when it comes to marketing your product. As we mentioned in previous posts, your retail packaging is what could influence an person’s purchase behaviour. In fact there are many ways packaging and marketing can work together to help boost sales. In this blog post we will talk about a popular marketing tactic used to boost sales and increase product awareness, and we will elaborate on how packaging could be used with this strategy. How Is Sampling and Retail Packaging Related? Sampling is a great way to get the consumer to try your product for the first time. One of the reasons it works so well is because a lot of the time it does not cost the consumer anything to try your product. Everyone likes free stuff. Now, how the sample is delivered involves careful planning. 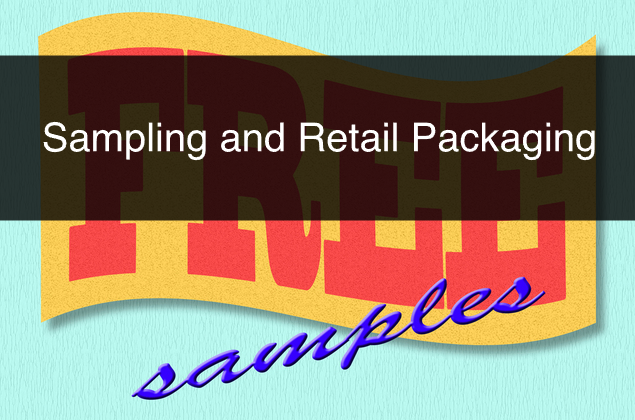 Sometimes a sample could be provided if a consumer purchases another product. A lot of the time samples are placed in products that compliments other products, or on a different product owned by the company. For example, when you purchase a certain type of spirit at the liquor store, and it comes with a sample of other type of liquor. Or having a sample of softener for the dryer, packaged with laundry detergent. The way packaging comes into play, is in how the sample is delivered. If it comes inside the other product’s packaging, the actual graphic design of the product changes to inform the consumer of what they are getting when they purchase. If the sample is attached to the product, it should have its own attractive packaging. Remember, you are introducing your product to the consumer, and how it is introduced is very important as it create a first impression. And it should be a great impression. Remember to plan and use the appropriate materials, graphics and literature. Think of it as a form of retail packaging. Another way of delivering a sample is with a direct marketing strategy. This is were you mail the samples to your consumers. There are many companies that specialize in direct marketing, and companies like ibox Packaging will design the right type of packaging for it to be mailed. If you have an eCommerce business, it is a good idea to include a sample of other products you sell with the mailed package. Not only do you introduce the product, but it adds value to the consumer and it might help winning them over as brand advocates. Finally, however you decide to deliver your sample, always consider how you are going to package it, or how you are going to modify existing packaging. For more information, or questions about packaging design or retail packaging please contact us. Also, sign up to our newsletter for more information, company updates, price specials, and more.